Similan Islands National Park – “Similan” is the Yawi (an old Malay dialect) word for nine. The Similan Island group is about 100km north west of Phuket or 50km due west of Khao Lak are the nine islands of the Similan Islands group. Each island has it’s own name but for ease each island has also been given a number, the islands are numbered south to north. The group of islands was declared as a Thailand National Park in 1982. Koh Huyong (1), Koh Payang (2) and Koh Payan (3) are the three most southerly island and are closed to tourist as they are a turtle sanctuary, though there are two dive sites (Boulder City & Shark Fin Reef) south east of Koh Payan which are open. Koh Miang (4) is one of the two islands which have a national Park Ranger station and tourist accommodation. The two main bays on the island are called Honeymoon Bay & Princess Bay as this is where one of the current King of Thailand’s daughters spent part of her honeymoon. This island has some air-conditioned and non -aircondition wooden bungalows and also tent accommodation. Very close to Koh Miang are Koh Ha (5) and Koh Hok (6), for tose of you who have learnt basic Thai you will realise that the Thai names mean island five and island six. The reason for this is simple, originally these two granite islands, which are connected by boulder which are submerged at high tide, were considered to be one island, whose name is unfortunately lost, Koh Payu (7) was thought of as number 6 and number 7 was Koh Pousar. Then some time in the 1980’s new legislation was enacted defining islands, it stated that an island had to have vegetation growing on it or it was a rock. 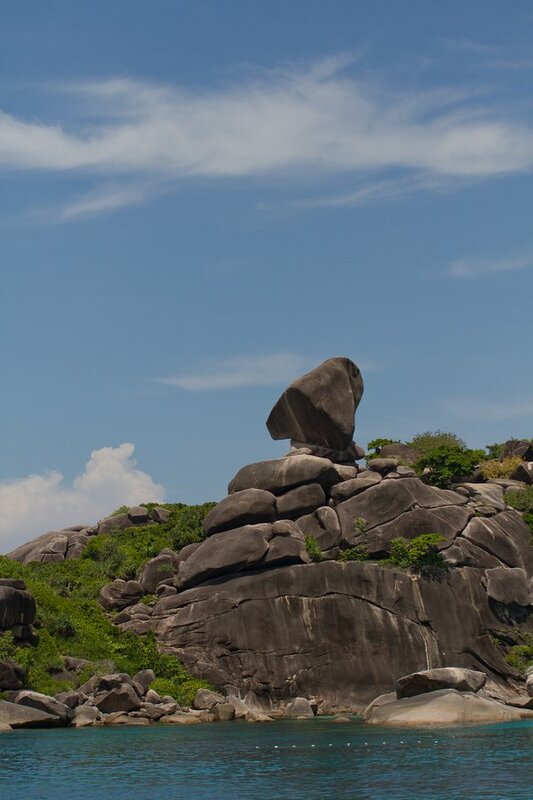 Koh Pousar (now Hin Pousar) is a group of large bare rocks so lost it’s island status. Now this caused a problem as Similan must be nine islands so island five was split to make two islands and Koh Payu renumbered from 6 to 7, there is still some evidence of this as the dive site on the northern tip of Koh Payu is called Deep Six. Koh Payu (7) has no beaches but one of the most famous dive sites in the region “East of Eden” named from the John Steinbeck book of the same name, which in turn took it’s name from Milton’s “Paradise Lost”. This massive and beautiful sloping hard coral reef runs down the south east side of the island. Sadly this reef was damaged by a strange natural phenomenon in 2010. La Ninia, which itself is caused by El Ninio caused the water temperature to rise to 35 degrees C and this temperature was maintained for about 6 weeks when the rains eventually cooled the water back to the normal 29-30 degrees, because of this shallow hard corals in the whole region were badly damaged. To allow the coral time to recuperate and to protect the reputation of the dive site the National Park closed the dive site in early2011. However there is still good diving on the other side – with the very original name “West of Eden”. Koh Similan (8) is the largest of the nine islands and like Koh Miang has a Park Ranger station and tourist accomodation (tents). A few hundred metres to the south of Koh Similan is Hin Pousar also known as “Elephant Head Rock”, this name was given by divers who thought that the rock looked like the top of an elephants head and trunk as it was swimming – exactly what gas mix they were using nobody knows but there was way too much nitrogen in it! On the north end of Koh Similan are more rocks with silly names, as you come into the bay on the north you will sea turtle rock (square turtle shell!? ), the bay itself is called Ao Geurk (shoe bay) or in English Donald Duck Bay, both names derive from a rock on the south east side of the bay which, depending on how you look at it could be both a low cut boot or a duck’s head. The main viewpoint in the bay (the highest rock) is known as Sail Rock, though it looks more like a disembodied nose. On the east side of the island are some long sandy beaches which can only be reached by boat and in about 30 metres of water the wreck of the Atlantis X, a Thailand Diving Liveaboard which sank in 2002. Koh Bangu (9) is the most northern island in the group, the entire north and east coasts are dive sites which all join together. Pingback: West of Eden - Tra i migliori Siti d'immersione alle Similan.